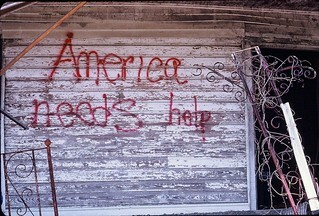 New-Orleans post Katrina 2006: "America needs help" graffiti on abandoned house. News-Orleans post Katrina. On an abandoned house the graffiti: "America needs help". NOLA 2006. Published photographs. Published again in Common Dreams on June 22nd 2016 to illustrate an article by Andrea Germanos "The IMF Warns That US Needs To 'Urgently' Tackle Poverty"
Published in TruthDig.com on June 20th, 2018 to illustrate an article by Beverly Gologorsky "What Does Poverty Feel Like?" Published in ABC Radio Australia on August 14, 2018 to illustrate a segment "Is America Becoming a Dystopian Society?" Contax G1 200 ASA Kodachrome.